For any big sports fans who read the blog you may remember the takeover saga surrounding English Premier League side Liverpool FC back in 2010. To cut a long story short the previous owners had bought the club on a leveraged buyout just before the global financial crisis really kicked off. By 2010 the situation was a mess with the owners unable to refinance the outstanding debt secured against the club. Seeking a sale the board accepted a bid from NESV, now known as Fenway Sports Group (the same guys who own the Boston Red Sox). All of this was dragged out in various courts in Texas and London, but ultimately FSG got their hands on the club for a knockdown price. There is a basic precept/combination that I have learned from Charline Munger & Warren Buffett that interests me in Red (Liverpool). That is the concept of acquiring a top global brand at a discount price and ensuring it is well managed. In some ways they really are in the dark ages – especially competitively. The best and brightest are not currently working on English soccer……..I’m also sure that it is a matter of time before they realize that the 38 games played by the 20 EPL teams should all be televised. This immediately made me think of Disney (NYSE: DIS) and the current situation regarding ESPN. On the one hand you have this great global brand (that actually owns many global brands like Star Wars and Marvel) trading at a seemingly nice price for long-term investors. On the other hand you know that there’s a reason for that discount in that the changing nature of media is throwing some serious questions at ESPN. Highlighting that symbolism further is the fact that currently Disney’s profit mix is split 50/50 between the “brand equity” stuff and ESPN. What Henry was touching on in that email was the almost endless possibilities for the future of content consumption. At the end of the day technology is throwing choice at consumers, and we’re slowly saying goodbye to the days when the only chance you get to watch a show is whenever it’s playing on the TV. The obvious exception to that is any content that is live; sports being the obvious big example here. In fact it’s increasingly the only reason I actually watch TV these days (plus a handful of HBO shows like Game of Thrones). As Disney shareholders know there are signs that this model is beginning to show some strain. If you’re a sports fanatic then you’re probably going to stump up for a TV package regardless of whether you watch movies, news, comedy shows or anything else for that matter. However, for folks who don’t care about sports they’re increasingly able to cut the whole TV package out of their budgets as they can consume content online. A few years ago the ESPN subscriber figure was somewhere around 100 million. These days it’s down to around 87 million. That creates a kind of negative feedback loop in that less subscribers means less fees and also less eyeballs for ad revenues. The worry is that eventually subscription revenue and advertisement revenue will fall below the licensing costs. Even if it doesn’t, the underlying profitability is still under threat. Ultimately the problem with that kind of decline is that ESPN doesn’t create and own the content; they license it from the various leagues. At some point the whole middleman role that ESPN currently plays (and which makes it a lot of money) could well be redundant. After all it’s not a massive stretch of the imagination to envisage a scenario in which the leagues can sell directly to customers one day. The NBA kind of already does this in its international markets by following Henry’s idea of selling all the games in one package for online viewing. This is the big break that separates ESPN from the other side of the Disney business. With a brand like Star Wars Disney could probably release a film every year from now to the end of days and still pack out movie theaters. Not only that, but it can then build out an extra section of its resorts and charge folks a king’s ransom to get in. If that wasn’t enough it can then deck out all its retail stores (and online) with more toys and charge parents extortionate fees for their kids’ Christmas presents, and so on. That’s what Disney can do better than anyone else. As it stands all of the negative ESPN stuff has led to some consternation in financial media regarding Disney’s future outlook. In fact if you look up the article list on Seeking Alpha you’ll see a chunk of them are bearish for this exact same reason. On the flip side you’re still in a situation where Disney’s non-ESPN segments are currently brining in around $8 billion in annual operating income compared to a current market-cap of $175 billion. In other words in the extreme case where I’ve just totally written off ESPN and Disney’s other media networks you get the other parts of the business for 22x annual operating profits. 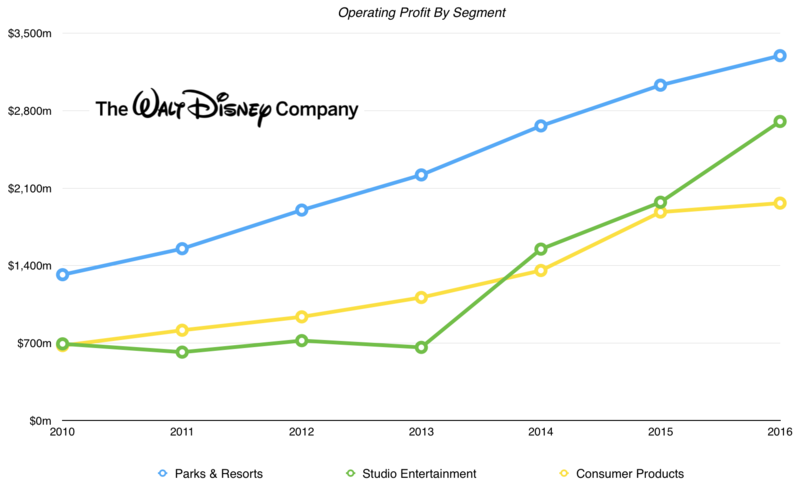 It’s not knockdown, but Disney have been growing those profits at annual clip of around 20% over the past six years. Granted, you have to contend with the struggle as fears over the traditional media business model is currently hitting those stocks pretty hard, however a major factor behind Disney’s great run over the past few years was the P/E multiple expansion after the 2007-2009 financial crisis. Eighteen months ago you would have been shelling out around $24 for every $1 of underlying profit to get your hands on Disney stock. Today you’d be paying just under $18 for the same $1 of profit. Even despite the uncertainty surrounding ESPN that seems like an okay deal (it was even better if you were buying at 15.5x earnings back in October), because whatever the media landscape looks like ten, twenty or thirty years from know it’s almost a given that Disney is still going to be at the forefront of it.